This half-day itinerary is a combination of guided sightseeing in Mihintale's sacred area and walking to some less-visited hidden gems. You can start this hiking tour every morning at 9.00 o'clock at First House Mihintale. In case you call or mail us, we can provide pick-up service from Anuradhapura or bus stands. We start our exploration at the foot of the Mihintale mountain at the ruins of a hospital complex from the 9th century. It is called Vedha Sala or Vejja Sala due to the Auredic treatment practiced here. The sophisticated ground plan is recognizable, the various sections will be explined by your guide. The most remarkable object is the stone trough in the shape of a human being. This so-called Bet Oruwa was probably used for medicinal herbal and oil baths. The hospital compley is situated on flat ground. But from now on, our hiking tour will go up and down in the hills of Mihintale. The ancient stairway into the saddle of the group of hills is one of Mihintale's landmarks. The wide flights of steps are restored now, rearranging the original stone slabs, some of which are of enourmous proportions. 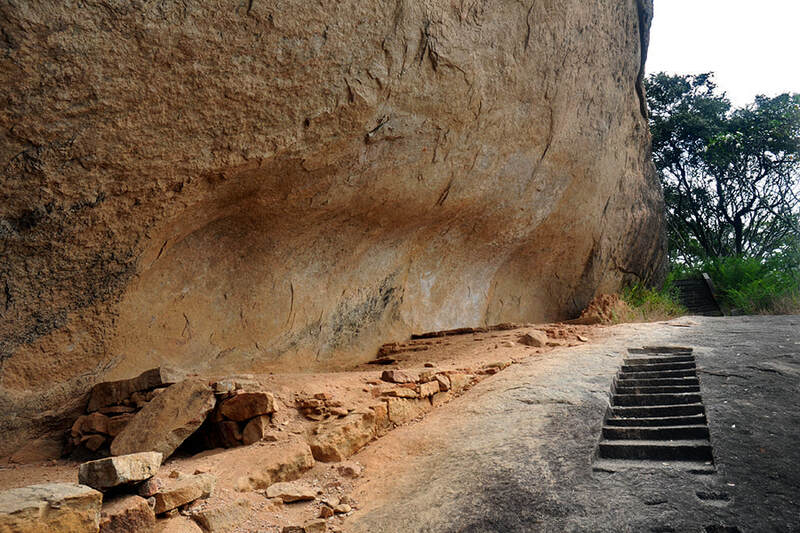 The first four flights of the stairway lead to the Meda Maluwa, which translates to "Middle Terrace". Before reaching this central area of the former monastic complex, have a look to the charming pond on the left side. It's called Timbiri Pokuna. With a little luck, you can observe birds and giant squirrels in this area during your hike. The next flight of steps, which is more narrow, leads to the upper saddle. It is this terrace, which is Mihintale's most sacred site, because this is the place where Buddhism was introduced in Sri Lanka. The white dome of the Ambasthala Dagoba marks the spot, where missionary Mahinda, after arriving from India, engaged the Anuradhapura King into a first converation. The guide will explain you the remarkable logic and ounchline of this ancient conversation. 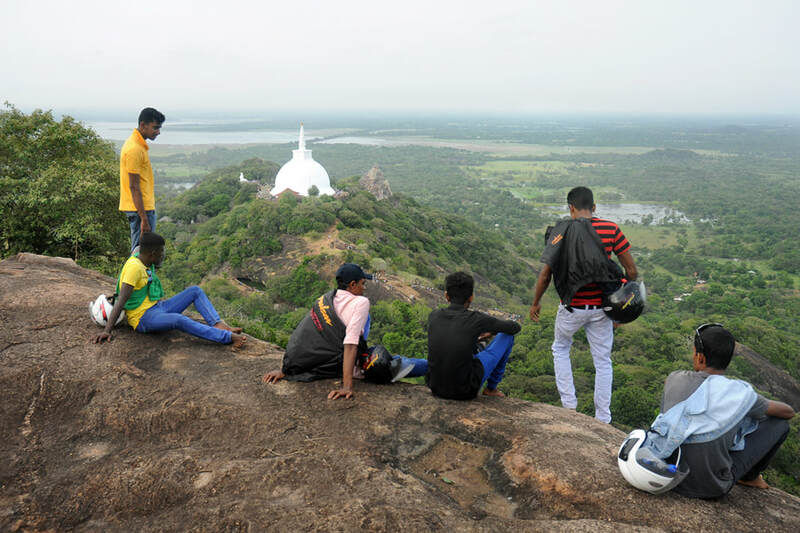 The terrace is surrounded by plenty of other attractions, such as the "invitation rock", where Mahinda stood with his companions when spotting the king, the cave with mahinda's stone bed, a new giant Buddha statue, and Mihintale's largest dagoba, the sparkling white Mahaseya. Furthermore, there are sacred ponds and significant rock and pillar inscription in this area of the Ambasthala terrace. Reaching these other attractions means not only hiking a few hundred meters more but also climbing more stairways up and down. It was named after the impressive depiction a five-headed cobra carved in the upright rock surface framing the pond at the rear. We continue our tour by walking along the Cobra Pond, locally known as Naga Pokuna. It callects water from the rock surface of the hill. Once it was distrivuted from here to the monastic complexes of Mihintale, to the refectory and the Lion fountain on the Middle Terrace in particular. Locals and hikers often enjoy a refreshing bath in the Naga pond, which is situated in a natural depression at the slope of the hill. It's a scenic setting, with nice views towards the west. Until know, we followed the track of Sri Lankan pilgrims and foreign tourists alike. But fewer of them climb the stairway to the very top of the Mihintale mountain range, though this slightly strenuous part of our hiking tour is really worth the efforts, since the Dagoba at the summit, Et Vihara alias Ath Wehera, is the best vantage point in the entire Anuradhapura district. Good weather conditions privided, Anuradhapura's giant stupas can be spotted at the horizon, just behind a group of lakes, all of which are artificial and ancient, from the first of the first millennium. After enjoying the views from Mihintale's highest peak, we return to the Middle terrace, where we know study the excellent carvings of the Sinha Pokuna, also known as Lion's Fountain. From here, another stairway leads to Mihintale's art-historically most significantly ancient building. Kantaka Chetiya is Sri Lanka's the oldest surviving dagoba which is still preserved in its looks of the centuries before Christ. Reason is, it was covered by earth for most of the time and excavated in the 20th century. Most remarkable parts of the structure are elaborately ornated Vahalkadas, frontispieces in all four cardinal directions, framing the ancient stupa's dome. Apart from the excellent carvings, traces of ancient paintings still surivive at the southern Vahalkada. 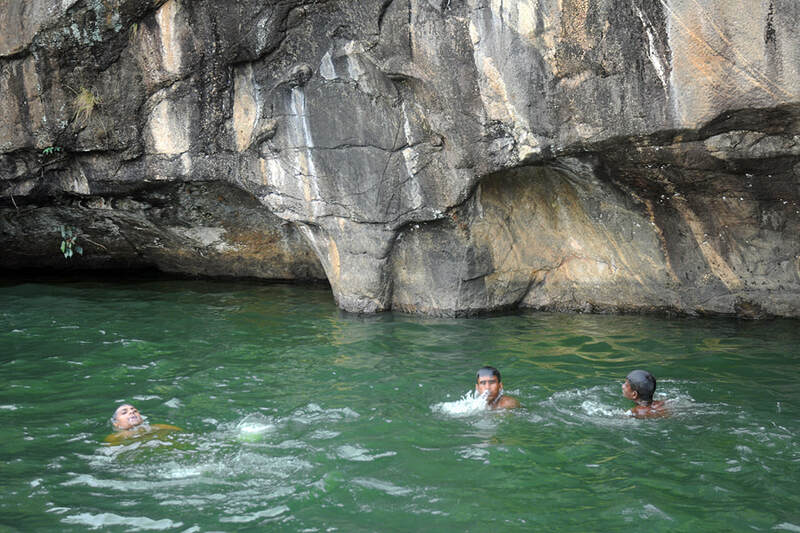 The area of Kantaka Chetiya is crowded with rock shelters, clled "caves" here. They were used as abodes by the earliest monks living in the Mihintale monastery. Our hiking tour will include a short detour to these caves. Our hiking tour will now leave the main group of Mihintale's hills and reach the "Dark Pond" at the foot of the them. 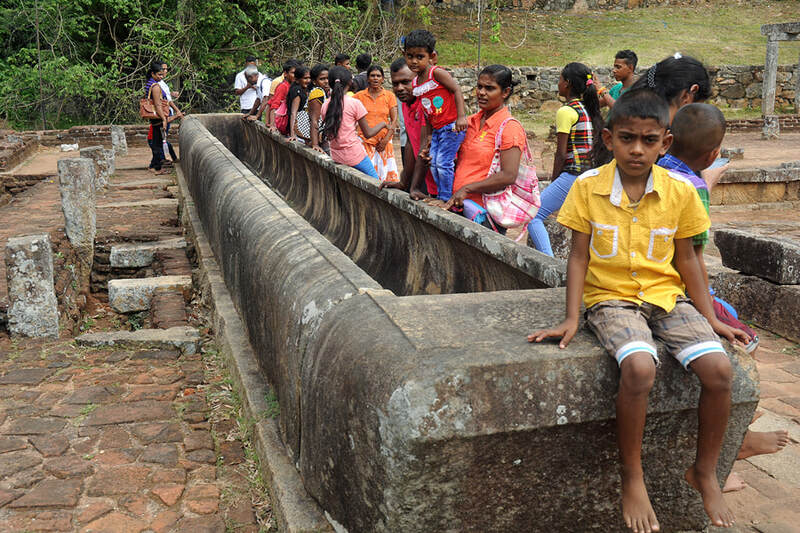 Kaludiya Pokuna, which is the Sinhala name for it, is an idyllic place, which once could have formed a separate monastery during the late Anuradhapura period. Some of the caves of this area, a little bit hidden, are still (or rather: again) inhabited by reclusive monks. Ruins of a dagoba, an ordination hall, a meditation platform and a cave temple surround the scenic lake, which by the way is man-made. Already ancient monks appreciated a nice scenery. 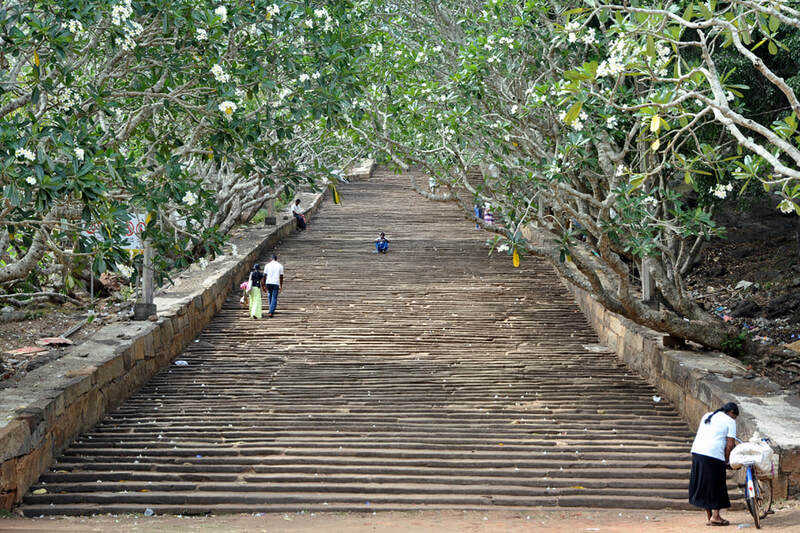 Not many tourists find their way to also climb the "Royal hill", which can be seen from Kaludiya Pokuna. Actually "Rajagiri" is another very ancient Buddhist complex, with inscriptions from earliest Buddhist times. The picturesque cave temple Rajagirilena, which can be reached via a partly ancient stairway, is well worth a visit and will be a perfect place for another break on your Mihintale hiking tour. 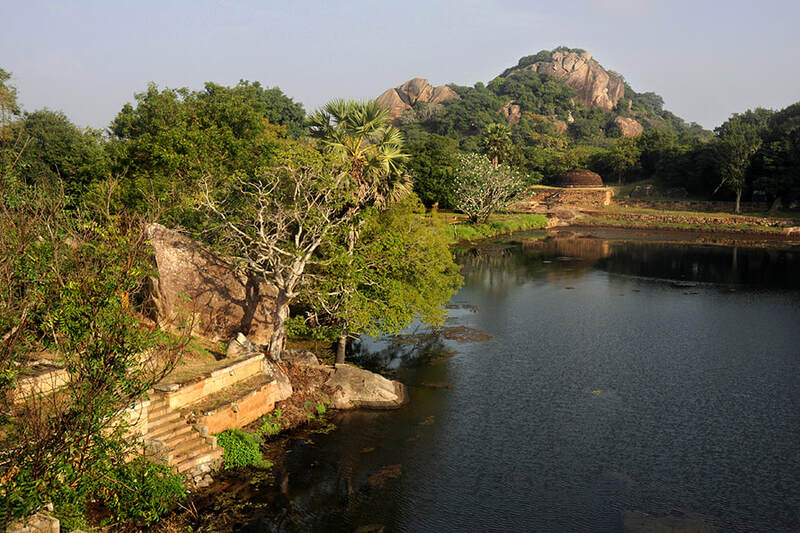 The final item on our Mihintale hiking tour itinerary is another ancient complex in the flat area in between Rahagirilena and the main range of Mihintale hills. This excavated monastery complex is named after its main stupa, Indikatuseya. 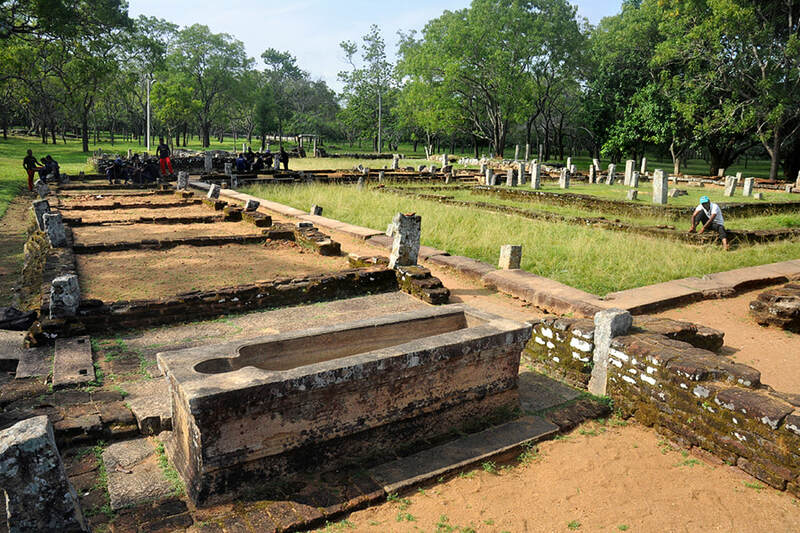 It was the finding place of Mahayana inscriptions proving the important role this version of Buddhism played in the late Anuradhapura period. It became extinct in the Polonnaruwa period due to monastic reforms. 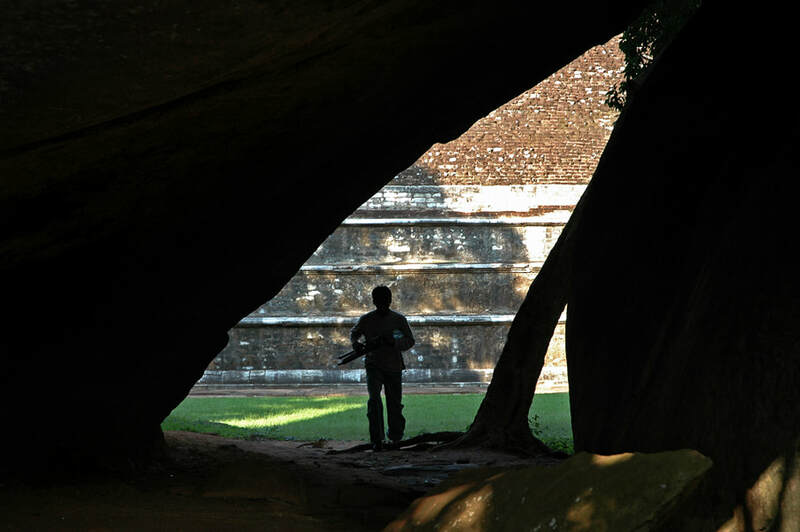 Today, almost no Sinhalese Buddhists are Mahayanists any more. 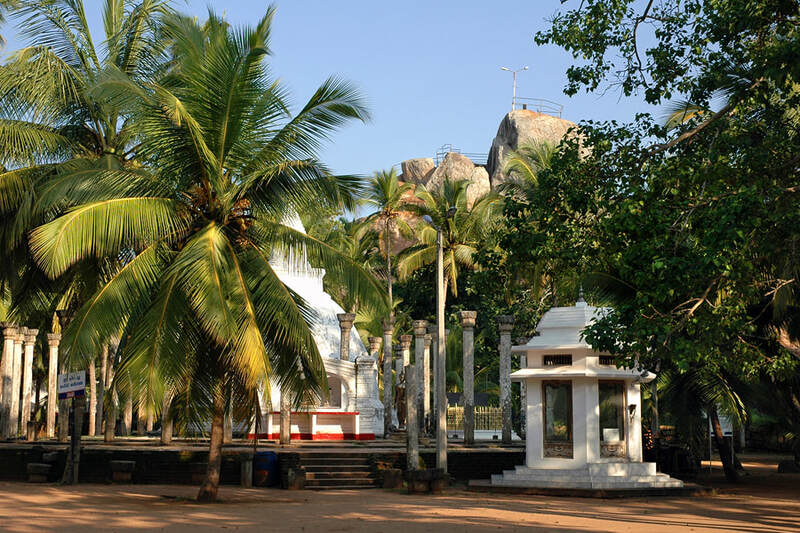 The former Mahayanistic Indikatuseya is located in only a few hundred meters distance from the ruins of the Mihintale hospital, which were the starting point of our hiking tour itinerary. So here our 4 to 5 hours walk will end. We hope you are surprised about the variety of natural beauty and cultural attractions this comparatively small area had to offer. We hope you enjoyed your guided hiking tour to famous and unknown places! Your day trip will start from the above address or from any place of your choice in Mihintale (e.g. central bus station or Mihintale Kanda ticket office). If you require a different start location please contact us, as we are able to arrange transportation for your convenience.